Solar has nothing to do with temperature & everything to do with the sun. I hear comments about them not working in winter but if you read or listen carefully, the people making those comments never own Solar Panels, They know a friend of friend or there is a solar farm across the street. Tucker Carlson thought a comic about Capt.America fighting Marvel’s version of the KKK was a bad thing. Do we really taking his advice on solar panels? I think Bob and Donald make some excellent points regarding the problem with solar panels when covered with snow and ice. It’s part of the reason that those in the power industry refer to wind and solar as “unreliables”, not renewables. With cold comes snow, ice, sleet and the like. Here in Minnesota we experience it all, from blasting sunshine to blizzards. Although solar cells have a purpose, and contribute to the grid, they only product when the sun is up, and when the cells are not covered with snow, ice and the like. I have two major solar farms close to me in southern Minnesota. Both have been covered with snow for weeks, and are producing little to no electricity, day or night. They have no snow removal system, no person has bothered to clear the panels, and the panels do not clear themselves, especially when the temperature is low enough to keep snow and ice sufficiently Frozen on the panel. Given this, the grid is not benefiting from this solar farm, and all our electricity comes from coal, natural gas or nuclear, we have almost no hydro power in Minnesota. Also, since there is no viable way to store electricity on the grid, even if the solar panels are producing at full capacity, we would have to consume all the power produced at the time it is generated. The only benefit is that it reduces the load on fossil fuel generators, which can reduce fossil fuel consumption. Either way, Minnesota consumes electricity mainly generated from fossil fuels, solar is a small contributor, when it can generate. This will be hard to change, even if a viable storage method is developed. Just wish I had the opportunity to lease out land for a solar farm. I have land within half mile of a substation. 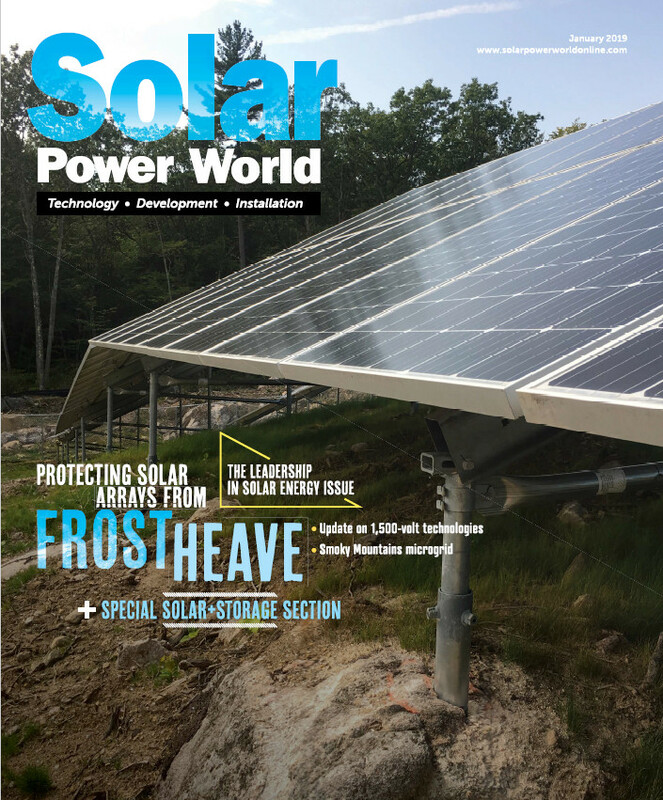 Another great article Solar Power World and Manish Nayar. Quest Renewables has many solar canopy installations in the snowy Northeast. When they are covered with 12+” of snow how well do they perform? This commentary is about cold, not snow. I will agree with you that the commentary… IN THIS ARTICLE… is about cold and not snow. The question is, did the author of THIS ARTICLE correctly or incorrectly assume that the author of the original statement was specifically referring to the efficiency of solar panels due to temperature? Since he (Jim Holt) said nothing about solar not working or even not working as efficiently, specifically due to the cold temperature, it is a valid question. When your posts are limited to however many characters that twitter limits you to, you sometimes have to give a ‘Readers Digest condensed version’ and it doesn’t always convey your intended message thoroughly enough for everyone to completely understand your intended meaning. If you are going to accurately interpret (nitpick?) exactly what the author wrote, let’s look at exactly what he wrote. He mentioned it being cold, the graphic was of the recent below zero temperatures in Chicago, he was referring to heating a house and mentioned AOC (who wants fossil fuels to be eliminated). Nothing was mentioned about a solar power source not working, or even being less efficient, specifically due to the cold temperatures. There are plenty of reasons that relying on solar panels as the sole source of energy to heat a home where it gets seriously cold is not a good idea. If your connection to the power company is lost, what are you going to do? Some would have fireplaces, but most of those fireplaces would not be able to heat the house anywhere near as well. The South side of my roof is full of solar panels and there are some more on the West side. I am familiar with solar photovoltaic systems. I am also fully aware that, all else being equal, solar power is more efficient in cold weather than in hot weather. The key phrase is ‘all else being equal’. The problem is that when you get far enough North to where that white stuff comes down from the sky… and stays for a significant amount of time… all else is usually not equal during this time of year. The author of this article stated “As long as the sun is hitting a solar panel, the solar panel will generate electricity— no matter how cold it is.” This is a pretty simplistic statement and ignores examples of how all is not equal. I really wouldn’t want to have to clean the snow off my panels every time it decided to snow. If you don’t clean it off, the sun won’t hit the panels. After you clean off the panels, then sun can hit your panels. It doesn’t take much as far as spots of snow, however, to noticeably degrade your output. I have seen the evidence on the app for my microinverters of how a few leaves sticking up on my neighbor’s bush/tree/whatever-it-is can decrease the output of a panel. What other ‘not equal, examples are up there?… What is the angle to the sun from the panel? How long is the day from sunrise to sunset? How many more trees or structures now block the sun since it is lower on the horizon? How much cloud cover is there? All of these factors regularly get worse during the winter. Then you would often have to worry about the possibility of losing your connection to the power company unless you have enough batteries to last you until your power is reconnected. How well would you perform when covered with 12+” inches of snow? Could it be possible that they were referring to the cold weather repudiating (in their minds) global warming and hence no need for alternative, less carbon intensive energy? Great article, thanks for dispelling the myth that power comes from heat! I’m having an assessment done to install solar power at our mid-Minnesota home. I was glad to hear solar installations are on the rise in MN.